During the first worldwar the Austro-Hungarian empire used artists to make professional paintings of the war. These painters did not become part of the army but were paid by it for their services, they were called war painters or in German Kriegsmaler. Sometimes they were attached to a specific unit or a theatre of war. In an album from my collection there are is a picture of a Kriegsmaler at work and also two pictures of the results of his work. Such pictures are hard to find. For a portrait of an officer (in my collection) made by a Kriegsmaler go to this earlier blog. Karl was a well known visitor to the front like many others from the royal family. There are many photo’s of him visiting the front. Especially from the period before he became the Austro-Hungarian Kaiser so up to 1916. And below my favorite of this small series. Karl needs a table for his map so he uses a decorated Huszar officer for this…. This is a very nice diploma given to Major Joszef Keresztes de Nagy-Baczon, Chief of Staff of the 38th Honvéd Infantry Division in 1917 for (only?) three months upon his discharge. The document is signed by the commanding officer of the Division, General Péterfalvi Molnár (altábornagy). Based on the rank the card dates between November 1907 and Oktober 1912. He used this card as a quick thank you note/letter to a Pehm, referring to him and other students he comes across in the field and that are doing well. He was the commander of the Theresian Officers Academy between 1905 and 1910 so this must refer to his activities there where this Pehm (and a Krainz he mentions) were his students. In the collection there are two Pehms with officers ranks so I am not sure which one is adressed here? Von Gieslingen had a long career but two incidents are notable. He was attached to Crownprince Rudolph at the moment he commited suicide in the Mayerling hunting lodge. The whole affair was handled by Von Gieslingen. His impact in the Redl affair could be even greater. He brought Redl as a young Russian speaking officer into the Evidenz bureau (Military Intelligence) of which Von Gieslingen was the commander at that moment. Later he made him his Chief of Staff of the 8th Corps in Prague. Redl as spy for the Russians probably gave all detailed plans for war to the Russians. The poor handling of the Redl case might even have been a main reason for the extremely poor performance of the AH army in the first war year. The plans most likely fell in the hands of the Russians but were not altered as Von Gieslingen claimed they had not been compromized. His own releive of command in 1914 due to poor performance might have been a result of this too. This is a compilation of several blogs that I had on another website. Some time ago I was able to acquire a medal group with papers (not complete but most was there) of a Hungarian officer who saw service in both world wars and the interbellum. Although the materials came directly from the family no additional information was there so this was the start of my research in which I tried to reconstruct his career based on his medals and archive materials. This is the Silver Military Merit Medal with swords in its original box and with the 1917 award paper to the (then) Lieutenant Nikolajevics in the 301st Honved Infantry Regiment – his name would be changed to Miklosy only in 1932. In the morning hours of the 5th of March, 1917 when superior enemy units attacked our positions on the Vinot heights, he distinguished himself with death-defying behavior and with energetic actions of the machineguns by, at the right moment giving strong fire against the flanks of the enemy attack causing strong losses, in which he contributed strongly in the repelling of the attack. He continued with his men, throughout the day, in killing enemy artillery fire that destroyed our positions almost entirely, to stand his ground. The 301st Honved Infantry Regiment was in 1917 part of the Austro-Hungarian 7th Army that fought in the Russo-Romanian front in these beginning days of the Russian revolution that would change the war. With my sincere thanks to the Hungarian Military Archives who provided me with the citation! In the interwar period he continued his service with succes based on his medals in that period, a bronze merit medal and a merit cross and continuing his rise through the officers ranks reaching the rank of lieutenant-colonel at the beginning of the re-annexations of lost territories. One medals is peculiar. Although this medal came with the official document it would have impossible to determine the reason behing it if not another piece of paper had accompanied it. The official report of the formal, military Hungarian participation in the opening in 1935 of a Mausoleum in Varna, Bulgaria. The Mausoleum was made in honour of the Polish / Hungarian / Croatian King Vladyslaw III. The Mausoleum was placed in Varna, the city in Bulgaria where history places his untimely death at the age of 20 in a battle against the Turks in 1444. A group of 4 Hungarian officers participated as the Hungarian delegation in this opening of which Miklosy was one. All participants received Bulgarian orders for their participation in the opening according to rank. Order, award paper and report. One of the requirements for the Hungarian Vitéz order was having a Hungarian name. For Hungarians of other descent like German or Slavic this was a big obstacle. Many officers with a non-Hungarian name decided not to apply for the Vitéz order or only very late like this officer only in 1932 (the order was started in in 1922). Probably he did this to improve his chances to further advance his career. His name changed from Nikolajevics into Miklósy! From 1939 up to 1941 Miklosy served as Lt-Colonel in the 7th Honved Infantry Regiment. This regiment is named after the Hungarian poet and military leader Zrínyi Miklós. Upon his transfer to the 9th Regiment he received a formal commendation for his work in the unit which was accompanied by this very nice table medal in it’s original presentation box. Both, the ranklist and the officers record (that is kept in the military archives) regarding Miklosy state that he received the Erdély (Transylvania) medal. This is shown with the sign of an encircled E. The medal was in the estate too but to my own surprise there was this paper that states he received the Military Merit Medal for the action in Felvidék (Southern Hungary) but he has not been awarded the corresponding medal for actual participation in that action in Felvidék. So a separate Medal for Merit regarding that action but no medal for the participation – did he do staff prepatory work? It will be impossible to tell what is the story here I am afraid. In the second world war Hungary was an unwilling, but nevertheless active, part of the Axis forces. Their participation on the Eastern Front with a hardly trained and poorly equipped army resulted in an enormous bloodshed. 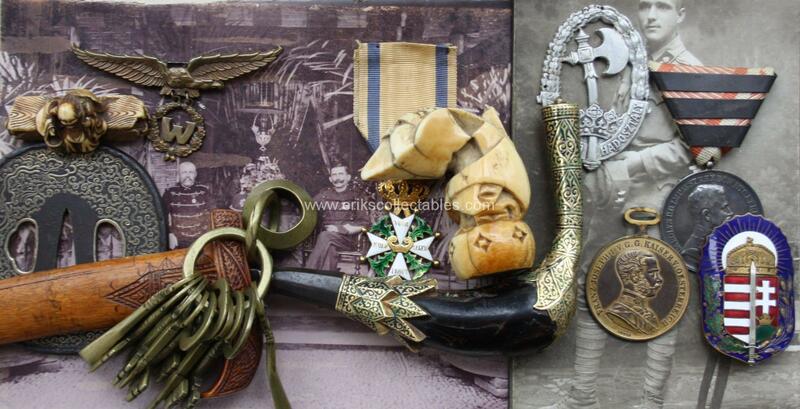 Miklosy was a part of this as commander of the 32nd Honved Infantry Regiment from October 1942 up to October 1943. In 1942 he got promoted to Colonel – in Hungarian Ezredes – literally 1000, so the leader of 1000 men. In Hungarian the word for Regiment is Ezred – so 1000 men. So it follows a colonel belongs to a regiment. Because of the war effort many Regiments were split. In this case the 2nd Honved Infantry Regiment was split in two with both officers and men and then officers and men were added to both units. So the half of a trained regiment with backfill of additional officers and troops. The so-called brother regiment would have the same number +30 so in the case the 2nd and the 32nd were brother regiments. Miklosy with his promotion to Colonel became eligible for the position of Regimental Commander and received the 32nd as his new unit to command in oktober 1942. From that period up to 1943 they were on the Eastern Front as part of the Hungarian 2nd Army near the Don bend, south of Voronezh. Miklosy was a replacement after the initial battles that cost more than 20% of the officers lives. They served next to the Italian 8th Army. Colonel Miklosy would “only” receive the Iron Class 2nd class from his German allies. A relatively low award for a colonel with one year service in the Eastern Front. Maybe he was not as co operative as they wished? From the Hungarians he would receive the Officers cross for the Order of Merit , with wreath and swords, a level up from his earlier peace time award. A rare order with only 215 awarded during the war. Unfortunately both the order and document are missing. His career after the Eastern Front was shortlived. He got involved in the Hungarian youth movement, the Levente. His commander saw him as unfit for further commands and promotions so he retired. This might have to do with the change in politics in Hungary in 1944 but the exact circumstances are unclear. At the end of the war he was taken back into the army with his rank of colonel to defend Hungary against the Russian enemy that was at the gates…. Due to this he ended his career as a prisoner of war of the Russians where he spend several years in their camps before being released. Hungarian Merit Order, officers cross. I am looking for an original as replacement for the missing one in this group! Although Machine Guns were not new in the beginning of WW1 they were still quite rare in the Austro-Hungarian army with only 2.700 pieces in the entire army. During the war the importance of the machinegun became clear and many new machineguns were produced and deliverd to the infantry but also to cavalry units (that often became dismounted) during the war and of course the mountain troops. By the end of the war more than 40.500 machineguns would be in use! Machine gun units could be recognized by the specific collar badge as can be seen above (not my collection) and sometimes also by the clothing in the case of cavalry units as can be seen in the photo’s furher below. The back from the postcard above, also part of Honvéd Huszar unit! The cavalry units that became dismounted during the war and most often acted as regular infantry. They also had machinegun detachments in their regiments. The collar badge was the same as can be seen with the Huszar in the photo above. But the clothing could be different, specifically the jackets had some different versions. Honved Cavalry Machinegun detachments Field Grey Fur Jacket (lower photo from the book The Emperor’s Coat). Dragoon officer of a Machinegun detachment with the regular Dragoon’s fur coat with white lambskin and not the black version. See pictures below from The Emperor’s coat again. And as last picture from my collection the Belobende Anerkennung (Bronze Signum Laudis medal equivalent) or honorable acknowledgment for the Commander of a Machinegun Instruction unit of KuK Infantry Regiment 48, received when he left this command.